Geeknbury Festival 2010 is a go! 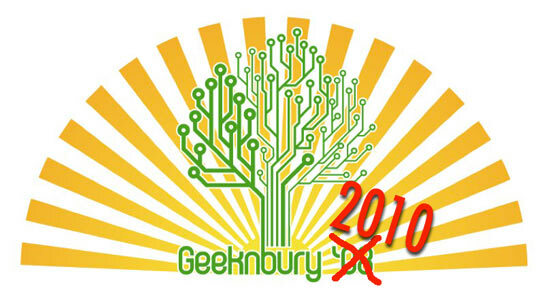 The Geeknbury festival is an outdoor event with no fixed abode. For the past couple of years though, at the invite of Rebecca Caroe and family, it has existed like a ‘plug-in’ to the legendary Vann Fest. Vann fest has been going as a private party/festival for a long time now and 2010 will sadly be it’s last year. This year’s Vann Fest is set for the weekend of the 30th of July but those attending Geeknbury can set up camp on the 29th as long as you have your ticket and are willing to help out the setting up on the Friday morning. It is a family (and geek) friendly festival with basic wifi and openings for all suggestions of the creative kind. For this you get entry for the festival, camping, access to all the music amenities and activities and a certain amount of food and beer (Saturday night dinner, beer/cider/soft drinks and Sunday morning bacon butties plus tea and coffee.) Not to mention the good times, connections made and great memories to take away. Hot tubs – 2 x 8 person (one for kids, one for adults) Bring your swimmers! Wifi – is available but if you have a MiFi all the better. Childrens activities eg play, mask making. More music/bands and an open mic stage perhaps? Tickets can be purchased from This Link and through the Facebook page.